Enjoy European ambience and world class hospitality in the finest downtown hotel. Featuring 179 spacious guest rooms and suites with city, ocean and mountain views. 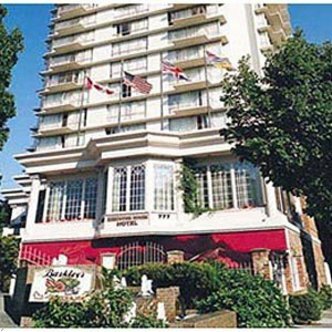 Directly across from the Victoria Conference Centre, one block from the magnificent Inner Harbour, Royal BC Museum, National Geographic IMAX Theatre, Parliament Buildings, shopping and Victoria's popular attractions. Deluxe one and two bedroom suites with full kitchens, living room and balconies. Executive floor rooms and suites with garden terraces and jacuzzi tub. Amenities include: complimentary in room coffee, tea, remote control television, in room movies, hairdryers, portable fans, iron and ironing board. Services include: health spa, whirlpool, aesthetician, steam room, concierge, fax and photocopy, room service, same day dry cleaning and laundry, ice and soft drink machines.